I haven't really been present on the blog lately. Life has been a mass of curveballs and uncertainty, and while it's all been for the best, it hasn't really allowed by the time to leisurely keep up on my blogging. In the last 3 months I've moved between three homes, slept on a number of friend's couches, traveled to New York to visit my Lyme-literate MD, weaned myself off most of my Lyme antibiotics, hosted two food swaps, led two cooking demos, and performed in an outdoor Halloween puppet extravaganza for thousands of people over two weekends. All while anxiously awaiting the birth of my best friends' baby and trying to finish an awesomely tacky holiday-themed crochet baby sweater. And finishing the Harry Potter books. And making lots of pies. Oh yeah, and working a full-time 8-5 job. Hot damn. I need a nap. Thankfully, my life seems to be settling down a bit, perfectly in tune with the impending season of hibernation. I just moved in to a wonderful home on Tuesday, where I will be living with three great roommates in my favorite neighborhood of Minneapolis. I am so grateful to be able to finally settle in to a place I could call my own, somewhere safe and comfortable. My crazy schedule and lack of stability has kept me from the kitchen, and I've hardly been cooking. I have mostly subsisted off eggs, salads, smoothies, and squash. 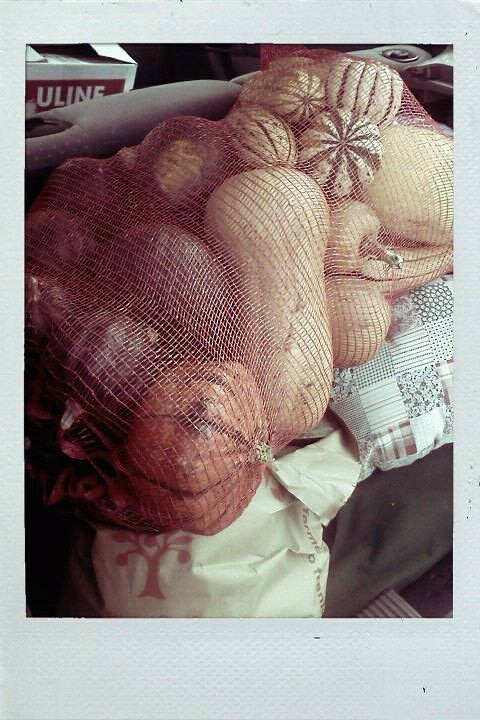 I picked up that gorgeous sack of squash pictured above from a farmer at the St. Paul Farmer's Market about a month ago for a mere $15, and it has been my salvation. I'm looking forward to unpacking in my new home, settling in to a new stable rhythm, and having time to focus on my healing process and on working on a new recipe project that I'm excited about. I'm thrilled to say that despite all the craziness that I've made for myself the last few months, I've been able to stay remarkably healthy and energetic. Although I feel pretty terrible at the moment - lots of body pain and lots of pressure in my head - I'm doing pretty darn well. It seems that I've reached a new level of success with my treatment for Lyme and all those other nasty little co-infections. My journey isn't over, but it sure has become a much more enjoyable trip. Life is good. I am lucky. Thanks for being here with me. Any of us with food allergies and intolerances already have a lot of work to do in the kitchen. But when you are also battling with any type of chronic illness, the challenge becomes even more intense. Combining a limited diet with feeling sick all the time makes it hard to get the motivation and energy to cook. I mean really, when you don’t feel well the last thing you want to do is cook, right? I have been fortunate that my Lyme symptoms have never made me totally unable to cook for myself. I have always been able to grocery shop and prepare my own meals. And while I've always been able to do it, a few years ago when I was very sick it was completely exhausting. I was so brain foggy and fatigued that preparing a meal took forever, and left me feeling trained. I lived alone and was working a full time job, and it was a serious struggle. During those times, I figured out some tips and tricks that helped me along the way - things that I still do today even though I'm feeling better. The trick is learning how to make the most of your time in the kitchen and get the most out of your meals. Making big batches, eating whole foods, and getting help from friends are just a few ideas. Here are some of my favorite things I learned, and I hope they help you too. Make big batches and freeze the leftovers. When you’re having a good day or when you have help from a friend, make big batches. It is more work on the front end, but ultimately, it leaves you with less work. You can eat off your big batch all week or freeze the leftovers for later. Basics like cooked rice, quinoa, millet, or any kind of cooked beans can last for 5-7 days in the fridge if tightly sealed, and they can freeze very well for months. Prepared foods like soups, lasagna (with brown rice lasagna noodles! ), casseroles, burgers and meatballs, and homemade breads and muffins freeze amazingly well. I use a FoodSaver to vacuum package all my foods for the freezer. Then when I am super busy or having a bad day and can’t deal with being in the kitchen, I can just reach in the freezer and get something wholesome! Get friendly with quick to prepare whole foods. Split mung beans and lentils cook quick very quickly and don’t require pre-soaking. Whole grains like quinoa, millet, and buckwheat cook in under 20 minutes. Make big pots of a couple different grains at the start of the week and eat off them all week in salads, soups, or just plain. Winter squash are nutritious and so easy to bake, and you can eat off them for days. Sweet potatoes and regular potatoes can be baked whole in the oven or microwave, and stored in the fridge for 3-4 days. Most vegetables can be eaten raw if you don’t want to deal with cooking them. Make a meal of bean dip, raw vegetables, and miso soup. Steam vegetables. Steamed vegetables take only minutes to prepare, are easy to digest, and can be eaten any time of day with any kind of other foods. You can steam vegetables on the stovetop with a steaming basket in a pot, or you can purchase electric vegetable steamer appliances if you don’t trust yourself (and your Lyme brain) with open flame. My rice cooker even has a vegetable steaming tray that I sometimes use if I don’t feel like using the stovetop. Make salads and get comfortable with eating raw. The easiest food in the book. Bag of pre-washed baby greens, some kind of protein (beans, meat, fish, nuts), and a handful of other vegetables, or a scoop of quinoa or millet. Add some salad dressing or a little oil and vinegar, lemon juice, or sprinkle of vitamin C crystals, and you’re done! Under 5 minutes. If your body tolerates raw vegetables well, learn to love eating raw veggies with your meals – less prep work, and good for you too! Eat plenty of nutrient-dense foods. Don't skimp on the calories and fat. Make sure you eat enough during the day, eating eveyr few hours to keep your blood sugar stable and your metabolism going. Assuming that your body can digest fats well, you should eat lots of healthy fats throughout the day. Not only will it help the your brains nerve coatings, it will help your body tissues, and give you a sense of satisfaction. Cook with coconut oil or ghee, and add olive oil, flax oil, pumpkin seed oil, and help oil to salads or over baked sweet potatoes. Eat plenty of avocados, nuts and seeds, coconut milk, and high quality olives. If you can, make bone broth, which is a good source of natural fat and nourishing gelatins. While you are healing, it is imperative that you keep your body well nourished, and eating quality fat can really help. I am writing this post in response to an article the Chicago Tribune posted yesterday entitled "Lyme Disease: A Dubious Diagnosis", by Patricia Callahan and Trine Tsouderos. I recommend you read the article first, to understand the perspective from which I write this post. I know this post is long, but I have a lot to say about this topic. I recommend reading part of it and then reading the rest later if you don't want to be overwhelmed. I just couldn't narrow it down anymore than I did. The Tribune's article, in my opinion, is biased, uninformed, and a blow to the Lyme Disease community and the reputation of decent journalism. A little information and a lot of ignorance is a dangerous combination, and results in reporting such as this that does more damage than it does good. It undermines the real face of Lyme, and is a slap in the face all of us who have struggled to heal and overcome this disease. Determined to share a real experience of the effect of Lyme, a group of Lyme Disease community bloggers and I are posting responses to this article. 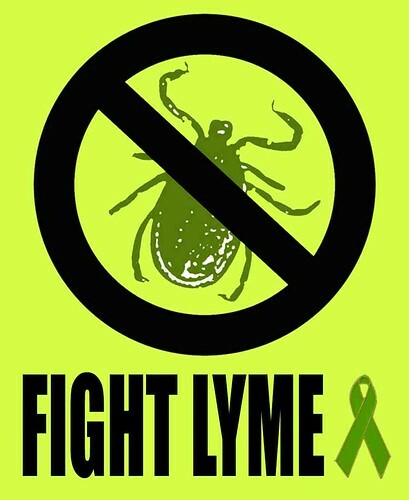 We want nothing more than for the medical and journalistic community to lift the veil of ignorance, confusion, and misinformation surround Lyme Disease. Updated from a post I originally wrote and published for Lymenaide, February 6, 2010. See that jar of Kohlrabi Garlic Pickles up there? It's teaming with happy, healthy bacteria. Bacteria gets a bad rap - bacteria is our friend. Sure, there are lots of bacteria out there that do everything from make food spoil to make body odor stink to make people very sick. As someone with chronic Lyme Disease, I'm quite familiar (and unhappy) with the constant microbial battle going on inside my body with those nasty little buggers. For years, Borrelia bacteria has been compromising my immune system and screwing with my body. My challenge since starting treatment has been to kick those bad bacteria out and replace them with the friendly bacteria that will make me healthier. Our bodies rely on healthy bacteria to function properly - without it, we'd die. The flora (bacteria) in your gut effects everything. Beneficial lactobactilli bacteria help your body deal with all the bad bacteria appropriately, stimulating the immune system to react. Bacteria also help your body digest food and assimilate nutrients, and break down toxins. If you are on antibiotics, it is clearing out ALL your bacteria, both good and bad, so it is important that you take steps to help restore good bacteria to your gut. Otherwise yeast infections and Candida will take over, and your immune system and digestion will suffer.